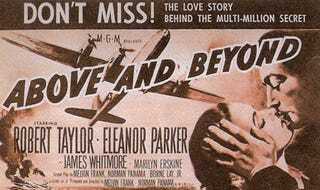 The film Above and Beyond is notable for being a film that deals with both the issues of nuclear war and the stress battle places on relationships shot soon after WWII. It's the story of Paul Tibbets, the pilot of the first atomic bomb dropped on Hiroshima, and his relationship with his wife. It's not the most engaging film ever and we wonder if Tibbets' views of what he did, which seem conflicted in the script, are close to reality given he once pretended to do a bombing run for an air show. Either way, it was predictive because he did eventually divorce his wife of the time. We're curious if this couple will divorce but we're not sure because of the cultural difference Tucker589 pointed out. Here in the Western Hemisphere, we push our significant others overboard before sacrificing ourselves.